Last year I purchased an antique grain sack from the 1880's with the intention of creating throw pillows for myself. Well, a couple of days ago I decided that my grain sack would serve a more practical purpose. This sack, over 100 years old and made from a gorgeous heavy weight hemp/linen weave would be perfect to transform into a couple of bags. So I went ahead and took the seams apart and the rest is history. 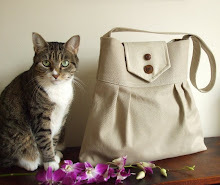 The two bags pictured are now available in the Pesky Cat Designs shop. I had a lot of fun and I'm already considering future upcycling projects! A while back I had the pleasure of meeting Cinders via Twitter and discovered her lovely shops filled with beautiful eco-felt jewelry and the coolest items such as aprons, bags and more made from vintage and retro fabrics. Cinders is super talented and a real nice person. You can find her unique jewelry in her shopsakaCINDERS andFrom Cinders. Her cool sewn creations can be found atPoppy's Garden Gate. And if you head over to her blog you a can see a sweet feature,Buyer's Paradise- Pesky Cat Designs, she posted about my shop. Thanks Cinders! Four new Wayfarer Purses were just added to the Pesky Cat Designs shop. The Pesky Cat was hard at work in the studio. Wishing everyone a great week ahead! Today was beautiful in St. Augustine and we spent it riding our bikes all over Anastasia Island. We biked through the state park, right on the beach and various roads. We stopped for ice cream and refreshments, visited friends who were selling their amazing art at the St. Augustine Beach Pier Pavilion and watched waves and surfers. Upon returning home we hosed off the bikes from all the sand and salt so they would be in tip top shape for our next trip. Later in the day I added three new faux leather totes to the Pesky Cat Designs shop. They are made from eco-friendly PVC-free faux leather and feature one zippered interior pocket, two slip pockets and a swivel key clip. For the latest news and links to new bags visit the Pesky Cat Designs Facebook page. 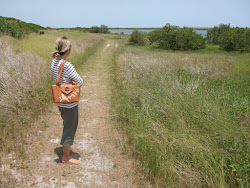 Anytime a new bag is listed in the shop you can find a link to it on the facebook page. I will also regularly feature Anni, the sweet kitty behind Pesky Cat Designs. So stop on by!